Some quick thoughts ahead of the “222 Showcase” tonight in Reading. We knew exactly what he meant. Our first exposure of the season, to the “ballpark smell.” Sausages and hot dogs and popcorn and roasted nuts and the cut grass all rolled into one. It was a gorgeous night and we had a lot of fun despite the blowout score. I started the evening lamenting the “7-inning showcase” but ended up thinking about the “mercy rule.” Still, a great night at the park, and the Reading staff handled things quite nicely hosting the packed house before the calendar even turned to April. The weather really couldn’t have been better. Tonight we head back down, and it will be a fair deal colder. I’m still working on perfecting my route in order to avoid sitting on 222 during rush hour. And while the sun will be out, it will indeed be plenty cold…remember, add one extra layer to compensate for sitting on cold chairs. 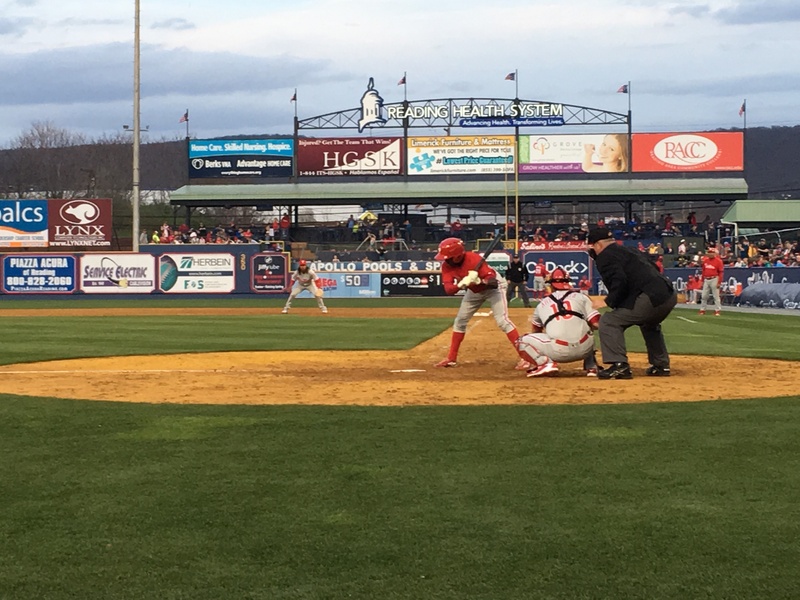 For the IronPigs, it looks like Mark Appel will pitch and go three innings, as will David Buchanan for three. Mark told me yesterday that he doesn’t mind the cold at all–despite being from Texas and attending college at Stanford. I don’t think the ball will by flying out as easily for anyone, tonight, but I was reminded of something Adam Morgan said to us last year on media day, “Keep the ball down and you won’t get your feelin’s hurt.” It’s words to live by, you know. Look for Nick Williams in Center Field. Look for Ryan Jackson at shortstop. Brock Stassi and Tommy Joseph to take 1B and DH, respectively. Andrew Knapp behind the plate. But we’ll see for sure as it gets closer. I’m not sure who will go for Reading, but we’ll be back there Thursday for opening day (weather permitting.) Roman Quinn should be in Center. Rhys Hoskins at 1B. Jorge Alfaro behind the plate. As the Pigs head up to Syracuse to open on Thursday, one of the worries from the coaches yesterday at media day was that they might not play much at all. Everyone’s champing at the bit to play real games, the pitchers to get stretched out and into the regular rotation, and the batters to stay sharp. If they head up there and end up only playing one game out of the scheduled four, it will create havoc with the routine–as well as the later schedule trying to make them up. First pitch tonight in Reading is 6:35PM. Ticket proceeds benefit Fightins Charities, and are only $5. Gates and seating bowl both open at 5:30PM. The game will be broadcast on Service Electric TV-2 locally, but doesn’t appear to be listed for MiLB.TV. I do believe you’ll be able to listen to the IronPigs broadcast on ESPN AM-1320/1230 in the Lehigh Valley, and to Mikey V on the Reading broadcast 98.5FM/1240AM.